Friends.. as said in our earlier post, PA/SA Exam 2014, for 07 Postal Circles, viz. Delhi, Kerala, Rajasthan, Assam, Chhattisgarh, North East, Odisha is scheduled for 27 April 2014. Click Here to see the schedule. Candidates applied for the above 07 Postal Circles can now download their Admit Card/Hall Ticket from the website by entering your registration number and password. 1. Candidates are requested to appear for the written test at the Centre on the date and time specified. Candidate should reach the test centre 60 minutes before the commencement of the examination. Candidates are permitted up to 15 Minutes after the commencement of the examination but however they are not permitted any extended time. 2. Maximum candidates have been accommodated at the Examination City of their Preference 1. However their Preference 2 and 3 have been also have been kept in view keeping the volume of candidates appearing in the examination and in the exigencies. 3. No change of Test Centre/test date and address of correspondence will be entertained. 4. Bring this Admit Card in ORIGINAL to the examination centre. Keep a photocopy of the Admit Card with you for future reference. You are required to put your Signatures on this Admit Card in the given box ONLY in the presence of Invigilator in the examination hall and it will be collected during the examination. should be immediately reported to the mailadmitcardhelpdesk.dopexam@gmail.com Relevant corrections, if any and accepted, will be made to your On-Line Admit Card and the same can be Downloaded from the website again. 6. Admit Cards will not be issued at the Examination Centre under any circumstances. 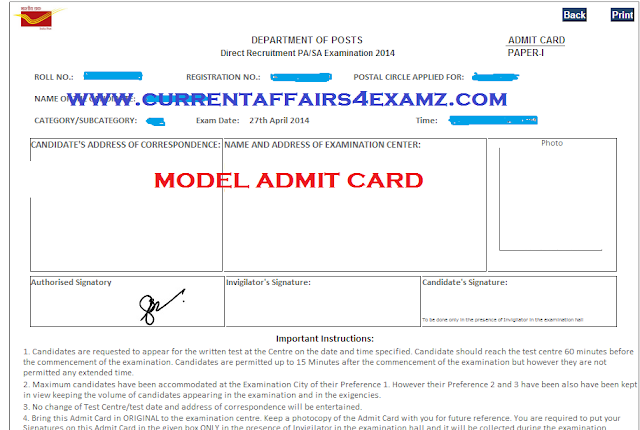 Printout of Downloaded Admit Card from the website www.pasadrexam2014.in are valid. Candidates will not be permitted without valid admit card. 7. Please ensure that you bring only ball point pen of colour Black or Blue for marking the OMR Answer Sheet. Marking with “gel” or any other type of pen is NOT allowed. 8. Answer Sheet is of OMR (Optical Mark Recognition) type. For every question there is only one Correct Option. Darken the appropriate Circle to indicate the Correct Answer. Please note No Change is permissible once marked. Applicant who darken more than one circle for any question can’t be valued and rejected. DO NOT put any stray marks anywhere on the answer sheet. Rough work may be done on the blank space in your question booklet. There is “No Negative Marking”. 9. OMR answer sheet has two copies. Do Not separate them. Impressions marked on the Original Sheet will automatically get transferred to the Copy. Original copy will be used for Result Processing. After completion of exam & before leaving the examination hall Candidate is to handover the ORIGINAL copy to the invigilator and candidate may retain Carbonless Copy. It is the responsibility of the candidate to handover the ORIGINAL OMR Sheet to the room invigilator before leaving the examination hall. Question Booklet is allowed to be retained by the candidate. 10. Candidates are likely to undergo searching/ frisking at the entrance of the exam centre. Please cooperate. 11. MOBILE PHONES/SCANNING DEVICES/ANY ELECTRONIC GADGET/ WEAPONS / FIRE ARMS are strictly prohibited inside the examination centre. Examination centre will not be responsible for its safety/loss. There is no arrangement made for securing your valuables. 12. Impersonation and/or possession of any material, electronic equipment even remotely connected or adverse to proper conduct and performance of the examination may render a candidate liable to be expelled from the Examination Hall and/or cancellation of candidature apart from any other punishment/penalty that may be imposed upon the candidate. 13. Candidates are not allowed to carry any papers, note books, books, calculators, etc. into the examination hall. Any candidate found using or in possession of such unauthorized material or indulging in copying or adopting unfair means will be summarily disqualified. 14. The duration of Paper is 120 minutes. The syllabus for the Paper I is already furnished in the Notification & FAQ on website. 15. Result of successful candidates in this Paper–I shall be published on the website. Candidate is advised to regularly visit the web site www.pasadrexam2014.in for ascertaining updates. 16. The candidature for this test is PROVISIONAL and is subject to fulfilling the education and other eligibility criteria as prescribed in the Notification/Advertisement advertised in the newspaper & also at the website www.pasadrexam2014.in. If Candidate is found ineligible at a later date his/her candidature will be summarily rejected. Mere appearing OR qualifying in the test does not confer any right on the applicant for claiming selection. 17. Visually Impaired (PH - I) candidate is requested to bring “Scribe” at his /her own cost. The scribe should read the Questions in low voice and mark the options as told by the candidate. It should not disturb other candidates in the room. Any misconduct by the scribe/ or candidate himself shall be treated to have been done by that candidate and shall lead to cancellation of the candidature of the candidate. Visually Impaired (PH - I) candidate will allowed 40 minutes compensatory (extra) time for completing the examination. 18. Canvassing in any form by the candidate would entail his/her disqualification. 19. Candidate will not be allowed to leave the examination hall till the examination is over. 20. Please read the instructions carefully on Question Booklet & OMR Sheet. The candidate should fill up all the particulars on the OMR Answer sheet legibly before starting to answer the questions. 21. Decision of the Department of Posts in respect of all matters pertaining to this recruitment test would be final and binding on all the Applicants/Candidates.